Celebrate the birth or adoption of a new baby with Balloonatics new baby-themed party decorations, or one of our congratulatory balloon bouquets. 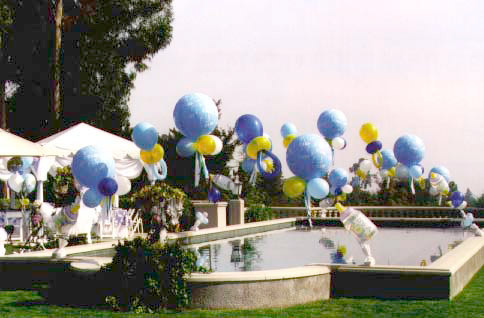 Delivered along with your personalized congratulatory message, our unique baby-themed decorations and colorful and long-lasting balloon bouquets will be sure to delight new parents, parents-to-be, and baby shower guests. These arches of balloon baby bottles and pacifiers provide a festive decoration for an outdoor baby shower. 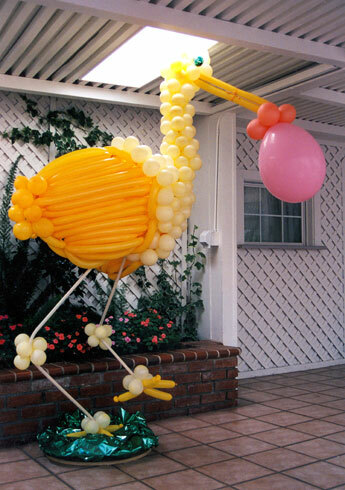 Balloonatics stork balloon sculpture stands seven-feet tall. It is an outstanding decoration and conversation piece for baby showers. Balloonatics baby-themed centerpieces and bouquets communicate the joy surrounding a birth.